iH8sn0w has released beta 11 of sn0wbreeze 2.8, the program that allows us to make a custom ipsw jailbroken for iOS 5.0.1. Sn0wbreeze 2.8 beta 11 maintain the baseband intact during the update so if you have an iPhone that needs unlock with Gevey 3G, you can use ultrasn0w but is Not compatible with iOS 5.0.1 so you can use only iOS 5. This version of the program is not compatible with iPad 2 or iPhone 4S so do not try to use to jailbreak. If you have 06.15.00 baseband you will be able to restore the iOS 5.0.1 and iB00ty will help to remove the device from Recovery Mode. For update to iOS 5 you must reinstall the iPad baseband in custom ipsw otherwise the process will not work: sn0wbreeze 2.8 beta 11 works only on Windows. This tutorial presumes that you have iTunes 10.5 installed and iOS 5.0.1. If it is necessary, change the file extension of the downloaded firmware at step 1 from .zip in .ipsw (if it’s needed). If you are on Windows Vista/7 then right-click and select on sn0wbreeze and Run as Administrator. You will receive a warning to not distribute the program, click OK and then press the blue button to continue. On Windows XP sn0wbreeze is not working properly and will not recommend to use it. Now you will be greeted by a screen asking you to look at the computer where you saved the iOS 5.0.1, after the program will check the file and then will appears the mark ok, then press the blue button to continue. iH8sn0w tried to implement a method of drag&drop files but unfortunately it does not work properly so I recommend you avoid using it. The program has three options work: simple mode, expert mode, and baseband preservation mode. Simple mode will make your custom ipsw on the basis of presets and expert mode enables you to customize anything you want to insert into the firmware, this tutorial will explain in expert mode. Baseband preservation Mode allows you to make a custom ipsw without jailbreak but it not make update baseband. ultrasn0w not work yet with iOS 5.0.1 so it is advisable to not update if you do not need it. Now we come to something more complicated. In this screen sn0wbreeze will display the options that we have in firmware setup, General option is what carries you through all the other so we select it. Select General then click the blue button to continue. Now you get to the screen that has only 5 options available than previous versions. The first is the Enable Battery Percentage option and allows the activation of option to see the battery percentage, the second allowed hackativation of the device, the third allow OpenSSH installation which enables us to access the system files of the device through Wi-Fi, the fourth is the Root Partition Size that allow us to select the assigned space partition system, we recommend leaving the value there. Press the blue button to continue. If you have an iPhone 3GS, in the next screen you will be able to update the baseband of the iPad that allows you to decode an unlocked baseband. Sn0wbreeze will automatically install the iPad baseband if you are connected to the Internet and after you install custom IPSW you can install ultrasn0w and you can use the device. My advice is to not install the iPad baseband because you will lose the ability to use integrated GPS forever. You will not ever be able to make downgrade of baseband and you will have problems when you restore to newer versions of iOS. Perform this step is mandatory if you update from iOS 4 to iOS IOS 5.0 or directly to 5.0.1. Now you get to the menu where you can select the applications from Cydia or from your computer to be automatically installed in the ipsw. Select from computer the files .deb desired using the option browse then press the blue button to continue. After selecting files you must go at the main menu where you must select Build ipsw to start the process. 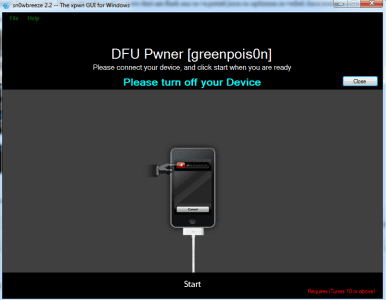 Now press the OK button to enter the device in Pwned DFU mode using sn0wbreeze. Connect the device to PC. After the process ends open iTunes, hold down Shift on your keyboard while you press on restore and select the custom IPSW made by sn0wbreeze, should have a name similar to the sn0wbreeze_iPhone 4-5.0.ipsw and should be on the desktop. Now that you made the custom ipsw and you put the device in DFU Mode and you made restore you have to start the device in tethered mode to get the jailbreak. To do this go to the desktop and looking-for-5.0.1 iBooty folder. If you can not run iBooty you will cannot open Cydia or Safari in any way. Open iBooty, get the device back into the DFU Mode and iBooty it will automatically restart in tethered mode and you will have a jailbroken device ready to use! What Makes the Best iPod Touch Cover?